Therefore; let John Bracken, Lloyd Ford, John S. Seiffert, George William Draves, George T. Morris, David Spitler, William Pearl Brown, and my servant William Branham be set apart as elders. Let them be very humble and swift to obedience, and the greater portion of the Spirit will come over them to lead the way. Let them be at work, for the Lord has heard their prayers. And then one night, I was coming out of Seattle, and there was a man standing over there. And he had a book under his arm. He kept telling me, "Brother Branham, you're in the wrong church." And I didn't know what he was talking of. And he put the book under my arm. 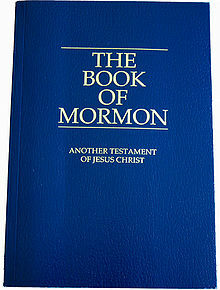 It was called the Mormon Word Of God. I don't know what it was. It's a--it's one of their prophets of The Latter Day Saint, some bunch of them, that they claims they see the neophytes. And--and back there a hundred and... long long... how long ago it was, it... on a certain page there... I have the book in my library. It prophesied, their prophet, and said, that, "In the last days that Germany would have a--a ism called Nazis." And it went ahead and said, "In that day, let W-i double l-i-a-m, William Branham be called and set aside in humility for the service that I have called him to." That's right. Although William Branham appears to think that this Mormon prophecy was about him, it is clear that this was not a prophecy but simply a reference to someone by the name of William Branham that William Draves knew. Joseph Smith did a great work in his day; yet he sinned before the Lord in many things by not keeping the commandments that were given to him, and in not building the house of the Lord; yet he repented, and in the end he will be numbered with the prophets of old. Many things will come to pass, for the Lord God has spoken, and has sent me as his messenger to prepare the way before him. I have established my Church in 1929 anew. I have given the message and it must be obeyed. All else is of man and I cannot, and will not accept the follies and traditions of men for my work is a holy work and man must first be made holy. It is also important to see whether William Draves was accurate as a prophet with respect to the other messages given to him. One example is his prophecy about the Second World War. On September 8th, 1939, the Messenger of the Lord, John the Baptist, appeared in my room at 2:15 a.m…. I saw Germany fighting brutally on Polish soil to take a spoil… I saw France press over upon German soil. I saw Russia press southward and great was the spoil thereof… Great Britain and France were together and had long tried to keep peace, but there was no peace, as all plans for peace were ignored… This war involved all nations. Then was the time when nations became divided and would not obey the counsel coming from the man in Italy… I saw that many of the home-loving German people had turned against the Nazi government which in their hearts they had never endorsed… A great army came from the north and east passing through what was German soil, going toward France. They met no resistance until they came to the Rhine River… Siege was laid on the great city of Rome. She resisted mightily. Suddenly she gave way. She was taken and burned and great was the burning thereof… I saw that Germany was no more; she had become divided, part of her going to America and part joining with the armies of the man at Rome. Great Britain was also broken up never again to be united as an empire. Great Britain being broken up and never uniting as an Empire. Of course, those who follow William Draves point out that Germany was divided as outlined in this prophecy. The question remains as to how accurate a prophecy needs to be in order for the speaker to remain a "true prophet". This page was last edited on 22 August 2015, at 05:05.